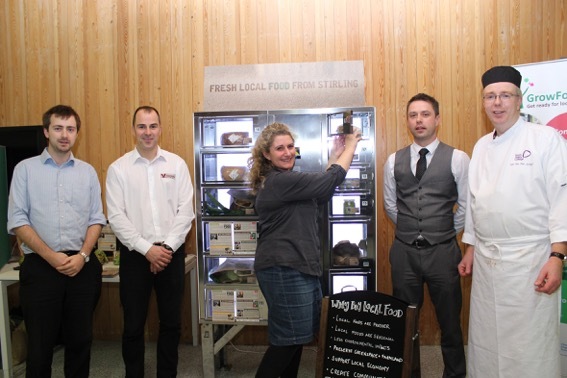 An ‘Festive Fiesta’ event promoting local produce at Forth Valley College’s Stirling Campus was the ideal place to launch a new vending machine. Forth Environmental Link organised the event to promote the excellent work they do in the local area to promote local food producers, healthy and environmentally friendly cycle initiatives and other worthwhile projects. Forth Valley College have been closely involved with several initiatives recently and were only too happy to have the new vending machine – supplied by Blairgowrie based Vending by JSR– located in the Stirling Campus refectory. Refreshingly the new vending machine is designed to dispense local produce such as honey, eggs, fresh vegetables and hand baked bread – which students and staff will be able to access easily. Clara Walker, Forth Environment Link Executive Director said: “We were delighted Forth Valley College could host our annual Festive Fiesta this year. This event brings together friends, partners and funders to review our activities over the past year and look forward to the year ahead. “This year our focus was local food and we started the event with the launch of our new fresh food vending machine. The innovative ‘mini-farm shop in the city’ will be located in FVC’s Stirling Campus for the week leading up to the festive break. The machine will be stocked with a range of local food goodies from hand baked bread to honey and eggs. “With over eighty guests sampling delicious canapés prepared by Ype Vanderchaaf’s team created from a range of locally sourced produce and mulled apple juice from the Fintry Hills, the evening started the foodie festive season in style. “Our collaboration with Forth Valley College on our local food work will continue into the New Year as we see a range of workshops being delivered by local food businesses, the first of which will be a butchery class in January with Cameron Skinner from Skinners of Kippen. We firmly believe that education is at the heart of behaviour change and look forward to continuing to work together on innovative new projects.” Stuart Retson, Director of Sales and Marketing for Vending by JSR, said: “Bringing local food producers together to supply the local community is a great idea. Customers can have fresh local top quality produce and then producers can make a little more profit meaning a win win for everyone. Our new fresh produce vending machine is the exact tool to bring this all together so when we herd what Forth Environmental link were trying to do we were more than happy to try and help. 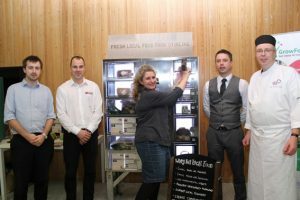 Alisdair Brown, Development Officer at Keep Scotland Beautiful, said: “We were delighted to join Forth Environment Link and attend the unveiling of the ‘Mini Farm Shop’ Vending Machine at Forth Valley College. “This initiative has been launched as part of the Forth Environment Link ‘Get Ready For Local’ Climate Challenge Fund project which aims to increase access to local, sustainable, healthier and lower carbon food. We encourage students, staff and local people to go and visit the machine while it is in the college and sample the tasty local produce.